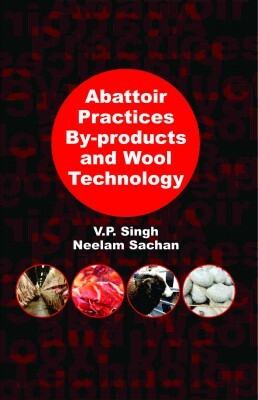 The book carries detailed information on: The fundamentals of abattoir establishments, slaughter procedures for quality meat production, scientific evaluation of food animals and carcasses are thus discussed in most effective manners. The sustainability of meat industry and meat food sector is basically dependant on abattoir by-products utilization. So different types of by-products generated in abattoir i.e. blood, hide and skin, intestines, bones, glandular by-products etc. are taken up in more understandable way. The waste generated and sanitary requirement of abattoir is also discussed in more realistic approach. All aspects of wool technology starting from shearing, sampling, wool structure, physico-chemical properties, processing and testing are elaborated in best possible efforts. The book will be of great value to serve the source of knowledge and information on these aspects for the persons engaged in meat and wool profession, business, planning and research.